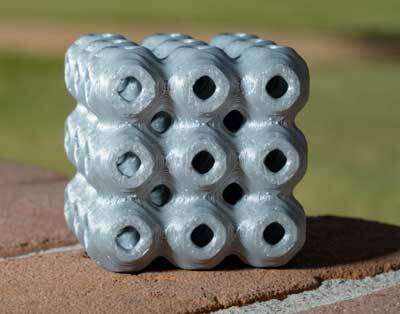 (Nanowerk News) Rice University engineers are using 3-D printers to turn structures that have until now existed primarily in theory into strong, light and durable materials with complex, repeating patterns. The results reported in Advanced Materials ("Multiscale Geometric Design Principles Applied to 3D Printed Schwarzites") are works of art that may someday lead to nanoscale electronic devices, catalysts, molecular sieves and battery components, and on the macroscale could become high-load-bearing, impact-resistant components for buildings, cars and aircraft. It may someday be possible, they said, to print an entire building as one schwarzite "brick." "You can make a whole building out of this material, and if something falls on it, it's going to collapse slowly, so what's inside will be protected," he said. "It is a little surprising that some atomic-scale features are preserved in the printed structures," Galvão said. "We discussed that it would be nice if we could translate schwarzite atomic models into 3-D printed structures. After some tentatives, it worked quite well. This paper is a good example of an effective theory-experiment collaboration."